A flag-waving protester in Algiers. Algeria’s doctors called for mass protests against Abdulaziz Bouteflika during Independence Day celebrations, ratcheting up pressure on an ailing president who is clinging to power. The president, in power for 20 years, announced last week he was reversing a decision to stand for a fifth term, but stopped short of standing down. He postponed elections and promised to adopt a new constitution under a reform plan. The changes halted demonstrations underway for more than three weeks against a ruling elite viewed as out of touch with a population suffering from economic hardship and corruption. Bouteflika (82) is rarely seen in public since a stroke in 2013 and protesters say he is unfit to rule. 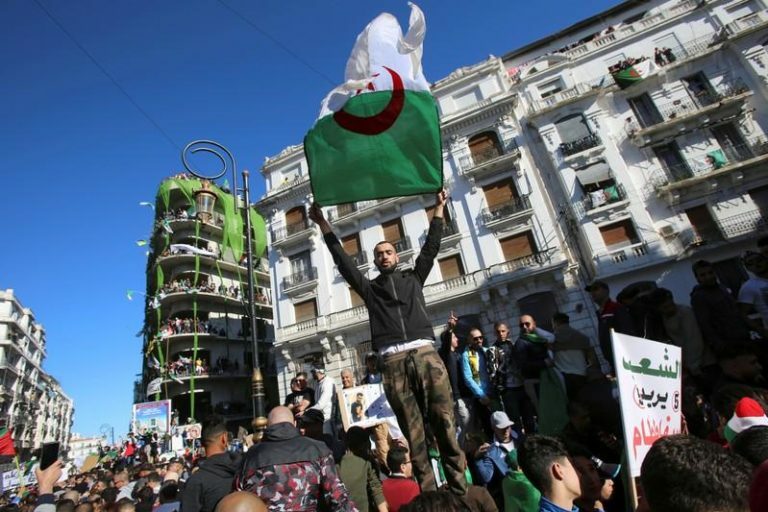 In the latest blow to the ruling elite, leaders of 13 independent Algerian labour unions refused to support Prime Minister Noureddine Bedoui’s efforts to form a cabinet. The prime minister planned to announce a new cabinet this week. Newly-appointed Deputy Prime Minister Ramtane Lamamra is expected to start a tour of some main Algerian allies abroad to explain the new political roadmap, said a foreign ministry official. The tour started on Tuesday with a visit to Moscow, Algeria’s most important military ally. It will also include EU countries and China, which invested billions of dollars in Algeria, pouring cash into housing and public works projects. Protests are mostly peaceful and the military, expected to keep its influential behind-the-scenes role as a power broker, remained in its barracks.